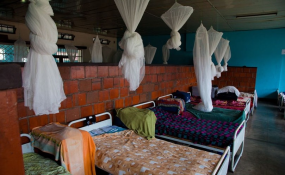 Mosquito nets hung in a dormitory at IFAK Secondary School in Kimihurura. Windhoek — At least 22 people have died of malaria across the country over the past three months, while 13 909 infections have been recorded, health minister Bernard Haufiku this week. Haufiku said a total of 22 deaths were reported from January to March this year. In 2012, the prevalence stood at 3 163 cases and four deaths. Between January and March last year, 18 people died while 1902 were infected. The most affected regions are bordering neighboring Angola, whose malaria transmission is very high compared to Namibia, Haufiku said while motivating his ministry's 2018/19 budget in parliament. Significant progress was made towards the goal of eradicating malaria by 2020, with a 96 percent reduction in cases and deaths since 2001. In 2001, 735 510 cases were registered with 1 747 deaths, according the ministry of health. The prevalence dropped to 3 163 cases and four deaths in 2012. "Unfortunately a resurgence occurred over the past three years with 24 682 cases reported in 2016, and 87 people succumbed to the disease," the health minister was quoted in March last year. Namibia earlier this year lost its ranking in reducing malaria in African Leaders Malaria Alliance (ALMA), a coalition of 49 African heads of state and government working across country and regional borders to achieve near-zero malaria deaths in Africa by 2030. Although Namibia was among the countries that received the same award in 2016, this year the country failed to make it to the podium at the 30th African Union Summit in Ethiopia at an awards ceremony that celebrates the reduction in the prevalence of malaria across the African continent. ALMA honoured six African countries during the 30th African Union Summit in Ethiopia, for exemplary leadership in reducing malaria, as the continent is endeavoring towards a malaria-free Africa by 2030. But Haufiku, put the blame for current statistics squarely on the shoulders of members of communities who bar health officials from their homes when the officials try to spray their houses with anti-mosquito chemicals. He expressed concern about communities, especially in Zambezi Region, that refuse to have their houses sprayed with mosquito insecticide, the chemical that kills mosquitoes and reduces the further spread of malaria. "In order for Namibia to win the war against malaria, communities need to comply with measures put in place such as the use of mosquito nets and pesticides," said Haufiku earlier this year. World malaria day was commemorated yesterday. It is an international day celebrated every year on April 25 since 2008. The theme for this year is "We're Ready to Beat Malaria- Are You?"